This cemetery is on the main Rt 150 from Cambridge to Parkman on the right. The stone is at the front of the cemetery that I found easily in 2001. Rainbow must be a sign of thanks for finding them. Nehemiah is in the Daniel Leavitt of Clinton Maine branch, part of the Nehemiah branch. They have children buried in the Cambridge Mt Pleasant Cemetery - see Roland's personal website. 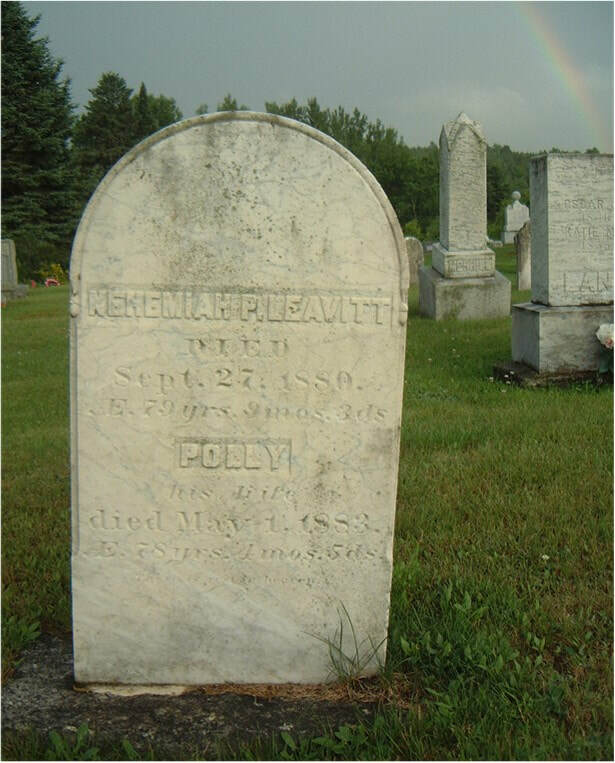 ​Nehemiah P Leavitt [born Dec 23 1800 in Clinton to Jeremiah Leavitt & Lucy Brown] died Sept 27 1880 AE 79 yrs 9 mos 3 ds. Polly [Drake] his wife, died May 1 1883, AE 78 yrs 4 mos 5 ds. They lived in Cambridge near the Parkman line on Leavitt Road.